Apologies that this isn’t as timely as I’d have liked. I’ve been meaning to craft this post for a long while. In a previous thought of mine, I dreaded the 2016 Disney adaptation of The Jungle Book–not just for colonial reasons, but for the blatant humans-are-better-than ____ (fill in the blank) mentality. HOWEVER…I was pleasantly surprised. Before watching the movie, I thought nothing of the fact all animals were CGI in the film–no need for captive animal actors/animal abuse. I’ve even seen the director, Favreau, give an interview where he seems proud of the fact no animals (except human ones) were used, never mind the exotic animal ban. From here on out is SPOILER territory. In his captivating tale of man-cub and beasts (originally published in 1894), Kipling delivers an account of a world both lethal and fascinating. In that world, we learn, there are packs we are born into and laws that have been devised to protect us; there are shifting alliances and adaptations that save us; there is danger but also care. Kipling’s fictional world is timeless, although for generations people have read The Jungle Book and comforted themselves by assuming (incorrectly) that their own times are far more civil, better educated, and more morally grounded. …His animal “community” includes characters whose traits are familiarly human: a mother wolf prepared to fight to her death for a child who is not of her own body; Baloo the sleepy brown bear who has “no gift of words” but speaks the truth knowing that “learned wisdom” can protect the young; Bagheera the black panther who is a cunning, bold, and reckless creature who also knows how to listen to nature; Akela the pack leader who would save his wolf family shame by teaching them honor; Shere Khan, a Judas in the jungle, ready to betray anyone; and the gray apes who have no leader and no laws. Such types are as common among humans on the streets of any modern city as they are in Kipling’s nineteenth-century Indian jungle. When Kipling places the gentlest of souls—a child—into this wild place, he introduces an implicit challenge to the Law of the Jungle. In trying to make sense of the jungle’s unspoken rules, the child, Mowgli, discovers his own creativity and natural curiosity—and naturally tests the rules. But he eventually realizes he needs the protection of those same sacred rules to survive. I disagree with that last part immensely, but agree they are still animals. Their dignity and differences have not been taken away. Aaaand, if you want to talk about a “capacity unknown to his animal brothers” let’s focus solely on Mowgli’s engineering feats. The animals are often afraid of what tools he uses–because change and the unfamiliar are scary–HOWEVER, they are forced to acknowledge his contraptions and inventions ultimately help them, whether it’s getting honey for Baloo or trapping Shere Khan. There is symbiosis. (Also, “Gentlest of souls”? A human kid? Really? Human children are the worst kind of turd. Maybe you need to play with a few sloth babies to GET REAL). 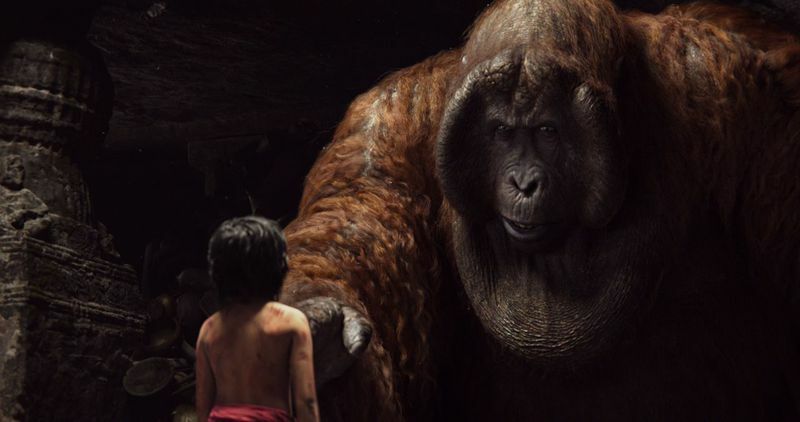 HOWEVER, to the greatest surprise of all, in the end of the the 2016 live action adaptation Mowgli does not decide to segregate to his “kind”–and definitely not out of superiority or sexualized reasons. He does not go back to man. He stays in the jungle with his animal family. He and animals co-exist. Whether the film’s message is intentional or not, our relationship with the animal kingdom is a “bare necessity” of life. Written by BLA and edited by GBG (thus the footnote).